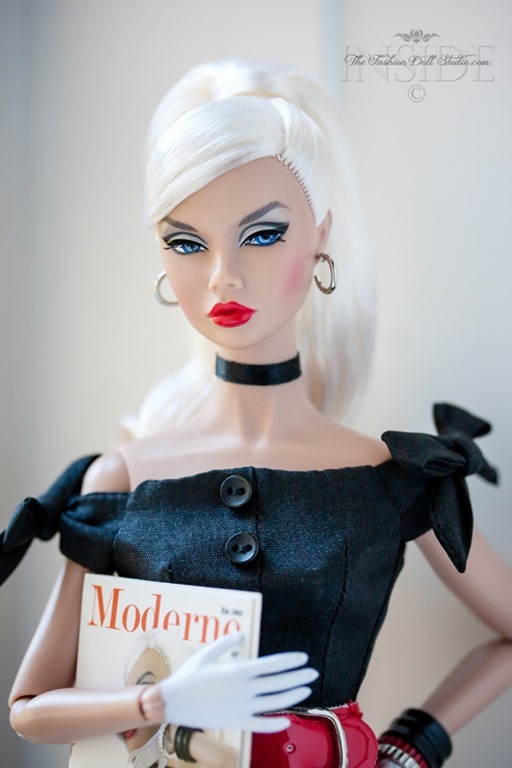 When I saw the name on this doll I kept singing the words from a song in “Devil Wears Prada”…”Supersonic, maginfique, tres tres cool and tres tres chic”. She is definitely tres, tres chic. the hair color is vibrant and beautiful. It needs to be trained a bit when you take it out of the hair net but not too bad (it was packed with hair off to the side so you will need to push it or train it down to sit down against the neck). What arrived was…I believe…better than the promos but with one caveat. She has a very sharp look to the left eye placement that frankly…borders on “wonky eye” for my taste. I have photographed her at her best advantage but I had to work at it. Not sure how I am feeling about that. She is gorgeous. Coloring and facial color screening is spot on. 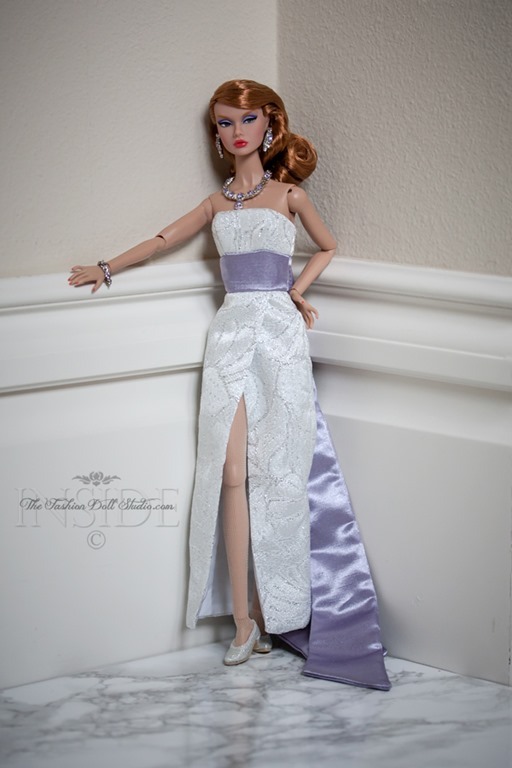 Dress is beautiful and jewelry is beyond…really beyond. But…that far to the left stare is looking slightly wrong for me. Not sure what I am going to do yet. Maybe it’s just mine so will be interested to hear what others are experiencing. 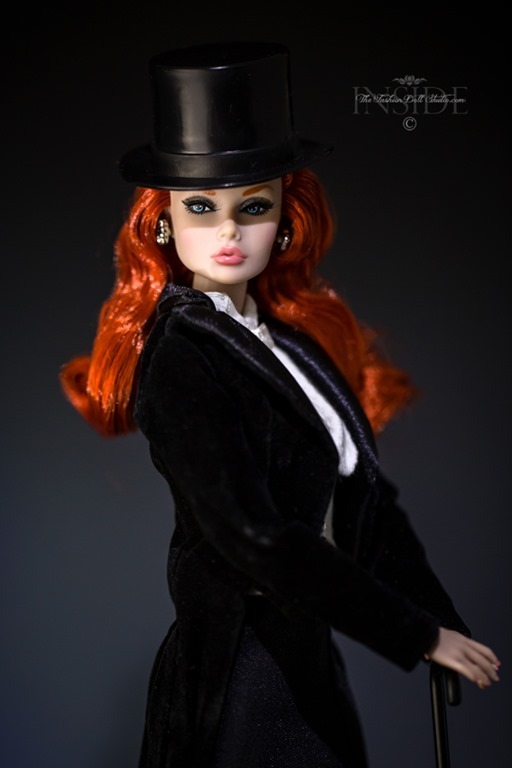 The WClub Poppy Parker Exclusive arrived just after I returned from Barbiecon a few weeks ago. As with most conventions, I have spent the last couple of weeks going through my acquired treasures and getting over “The convention cold”. When you put around 1,000 people together in a ballroom for multiple events, and these same people get on average 4-5 hours of sleep a night…there is bound to be illness. 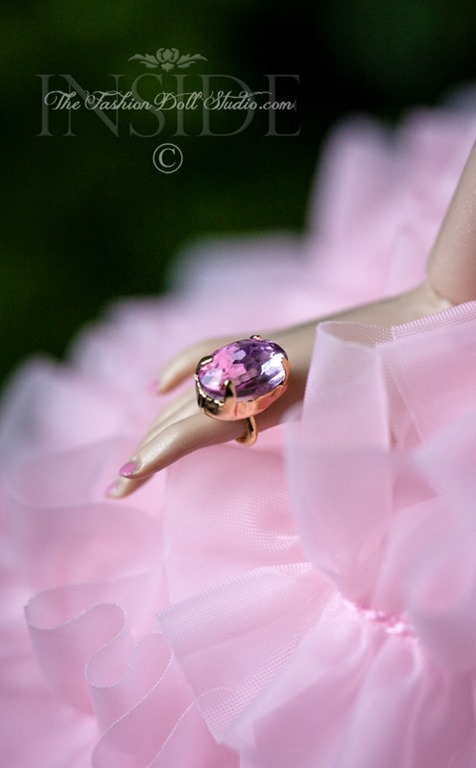 So… now I am on the mend, I managed to snap some images of this new Poppy Parker and get them ready for the blog. This one comes to this collector WAY better than the promo shots promised. And the promo shots were pretty darn good. She is simply stunning! Love, Love, Love her. Love the accessories with this giftset! Lot’s of mix and match options. I recently had a new logo designed for my main photography business and wanted to try it out on some of the doll shots too. Not too bad Thank you Daniel at Photologo!! 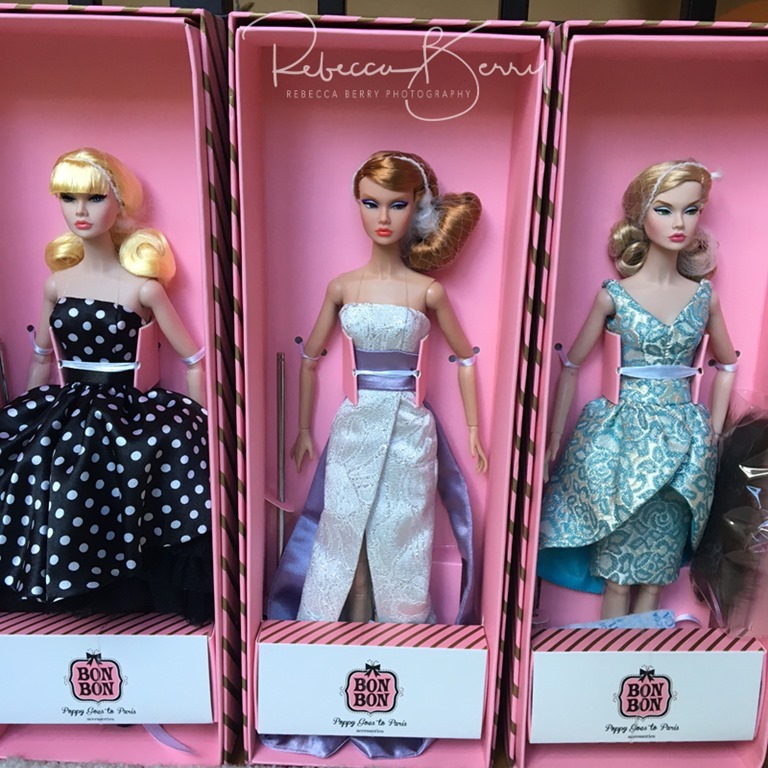 For those of you awaiting the beginning of the series of posts on the blogging and doll photography presentation I did at Barbiecon…fear not. It should be up starting this Friday, August 19th. For those of you who did attend the class, the images in this post were taken using the “light bouncing” technique I talked about. So, I may not be the queen of procrastination but I believe I would be voted onto the court of princesses of procrastination. I kind of like the sound of that…”Princess of Procrastination”. Anywhoo, I am supposed to be finishing up my presentation for this years NBDCC. I am supposed to be putting the finishing touches on it, wrapping it up and putting it to bed so I can start getting packed for the flight I am taking in a little over 36 hours from now. Am I doing any of that? Noooooooo. Instead, today I received a couple new Poppy Parker’s and I am playing instead. Guess this means I am finishing up the presentation on the airplane. Love the lavender eyes!! Everything about this set that was promised…was delivered. She is adorable and the little poodle is to die for. Well done David!! I will have to come up with a suitable Paris themed set when I get back from convention. Now…back to the presentation. 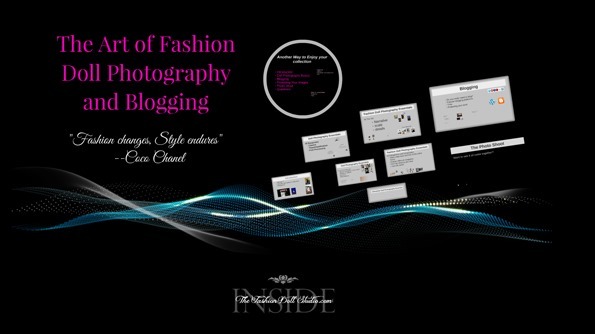 If you are attending the NBDCC and are interested in learning more about the photography that I do here on the blog, I will be presenting on Thursday, July 28th at 5 pm in one of the Riverfront rooms at the Hyatt Jacksonville. The time had to be changed from original schedule due to scheduling conflicts. And I wish I was going with her! When David Buttry announced this theme for Poppy Parker last year at convention, I thought I would faint of pure happiness. 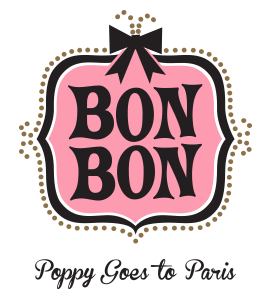 Just the thought of this theme and I was dreaming of all kinds of fabulous Poppy Parker Parisian style. 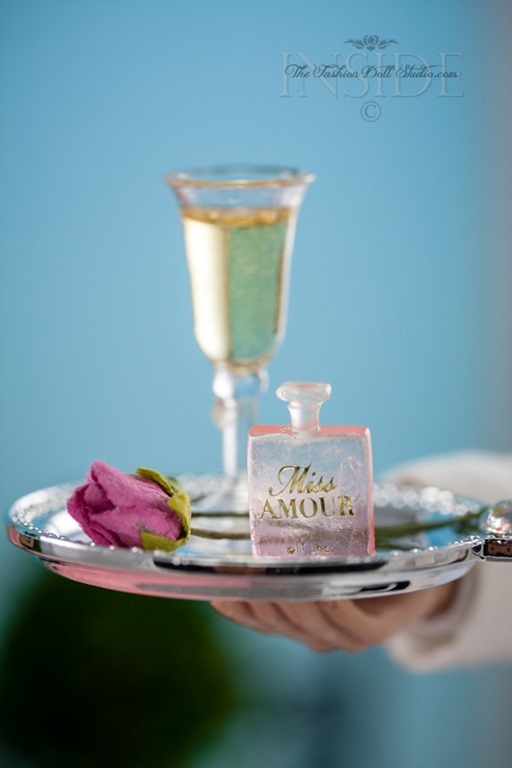 What David Buttry and Integrity Toys gave collectors yesterday were those dreams realized and a confection in pink that has this collector claiming she has seen nirvana…and her name is “Miss Amour”. You will see what I mean. 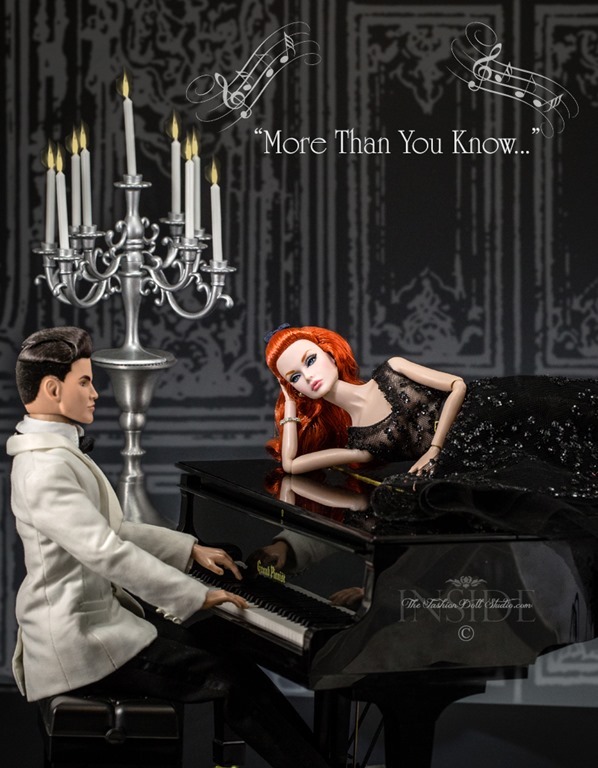 The following dolls will be available at Integrity Toys Dealers. If you are at all interested, you should contact IT dealers NOW. WClub members had 24 hours ahead of you to order. Some of these babies are already sold out. Well Bonjour! The train case alone had me saying “ Oh yes please”. Added to it, the adorable houndstooth coat and gloved hands made me happy too. David Buttry explained to WClub members that there is a range of different facial screenings in this collection so you will see older makeup and newer facial screenings all within this offering. What’s the first thing a girl is going to do in Paris? SHOP! And you won’t just throw on a pair of jeans to go shopping in Paris…you need to do it in style. 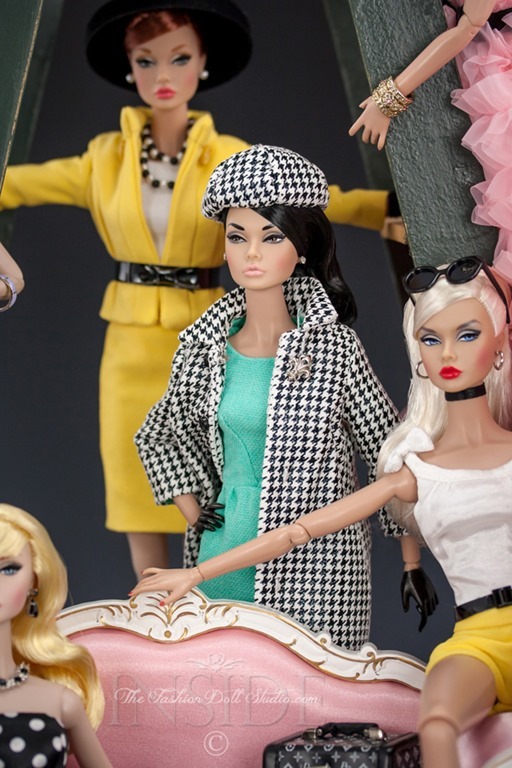 This black, yellow and white suit with hat and gloves ensures that Miss Poppy will indeed be shopping in style. 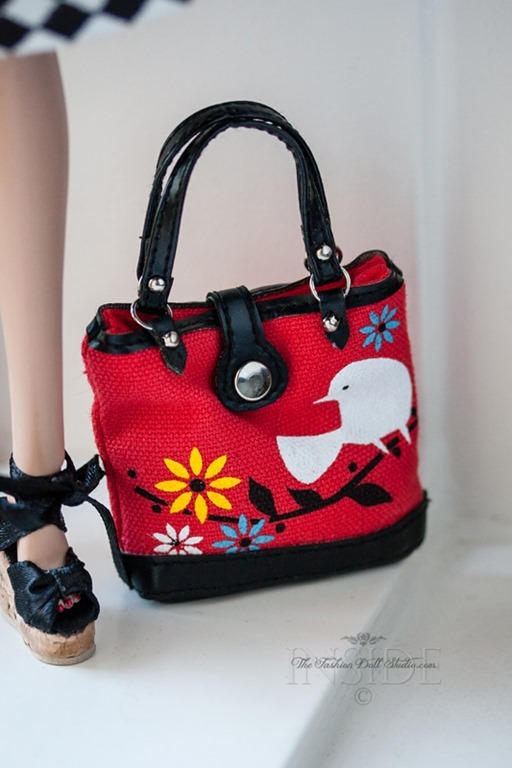 The little bag ( reminiscent of an Hérmes Kelly bag) adds that fabulous finishing touch. I love the french twist hairstyle on her too. 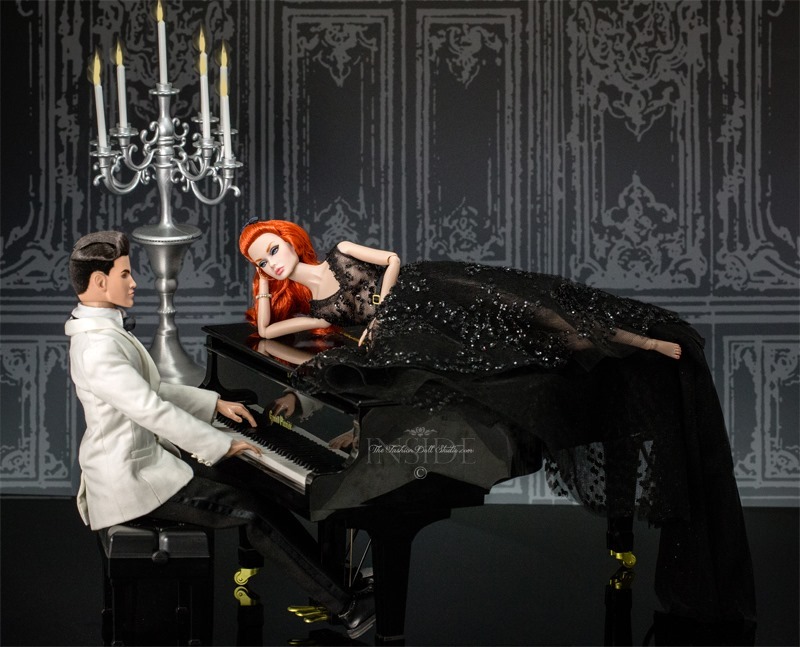 I am also noticing that there will be plenty of mix and match opportunities within this collection and the doll offered up as the Poppy Parker club doll. Thank you for that David! I adore the color here! This Poppy showcases the newer facial screening this year..gorgeous! I love the little clutch and open toed shoes. Miss Poppy is off to L’Opera Garnier in style. Translated..”This is so good”. Indeed she is! Poppy is ready for a night on the town in this adorable little polka dot confection. I already have her pictured at a little table at Laduree for a future photo shoot. 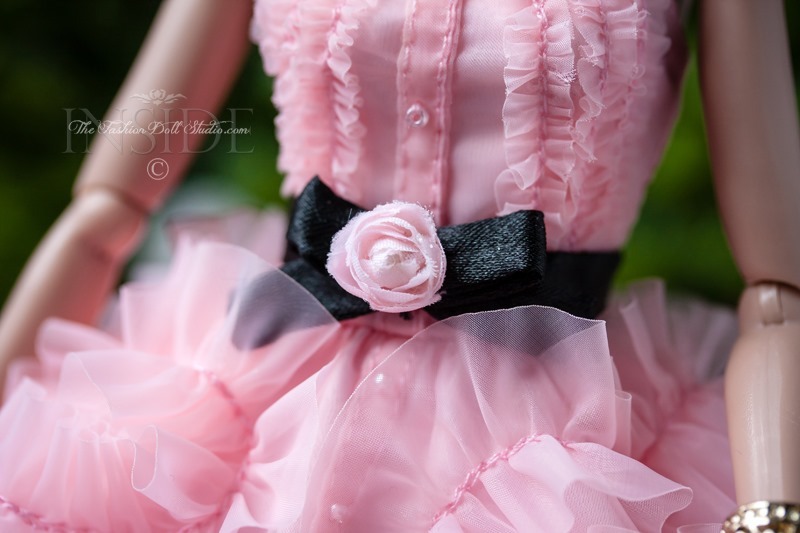 If I am already thinking about the photos I am going to take of a doll…she is already in my shopping cart…no question. They had to throw in the poodle! Game over…I’m buyin’. Other irresistible items with this gorgeous Poppy are her lilac/pink gloved hands and that straw purse!! Adorable! The poodle’s name is Phoebe. The color palette of this collection definitely points to the fact that Poppy is traveling to Paris in the springtime. David Buttry confirmed this in a webcast about the collection. I adore this lavender on the strawberry blonde tresses of this Poppy. I also love the new updated facial screening on this one. 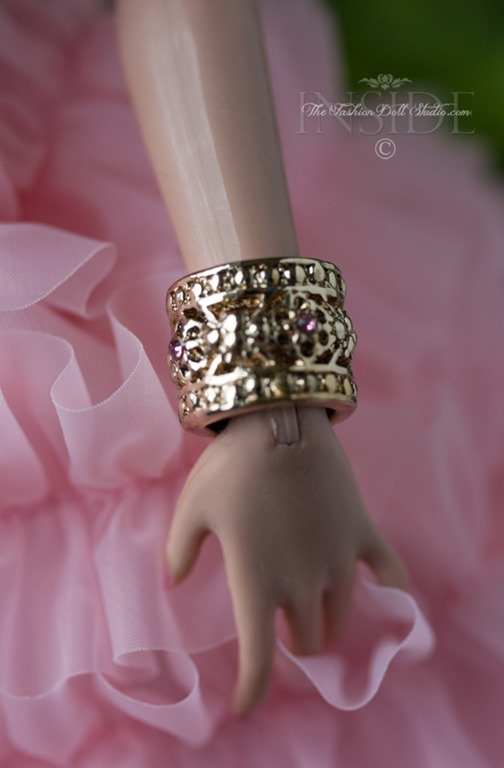 It looks like we are getting some new and more sophisticated jewelry for Miss Poppy. NICE! 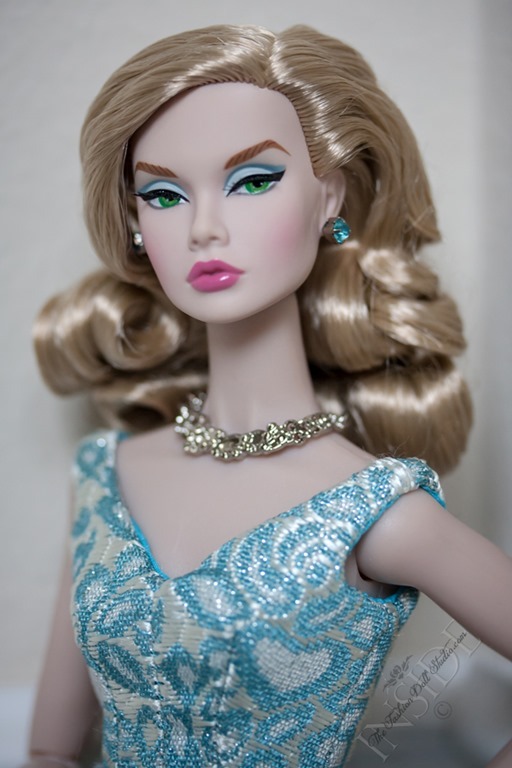 I also love that the “Paris in Springtime” outfit will go nicely with the facial screening of this doll and vica versa. This collection is an out of the park home run in my opinion. This is exactly what I enjoy collecting. I was happy with the base collection but the upcoming lottery offerings are what have me and many other Poppy Parker collectors salivating. Oh my word!! She comes with a teddy bear and diary….too cute!! Why oh why does she have to be a lottery doll?!!! Here is hoping that the lottery Gods are kind to me. Looks like the lottery tickets will be sold sometime in late summer. The verbiage says IT direct so not just WClub offering on this one. That makes the low 700 edition size even more alarming. Many more fish in the pond to vie for the right to purchase this beauty. Good luck to all! 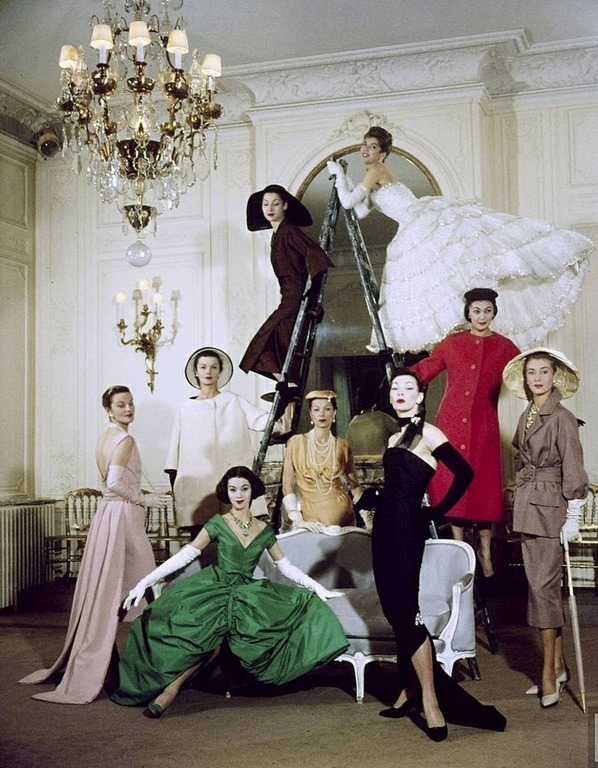 And…finally…the pièce de résistance so to speak of this collection in my opinion…. 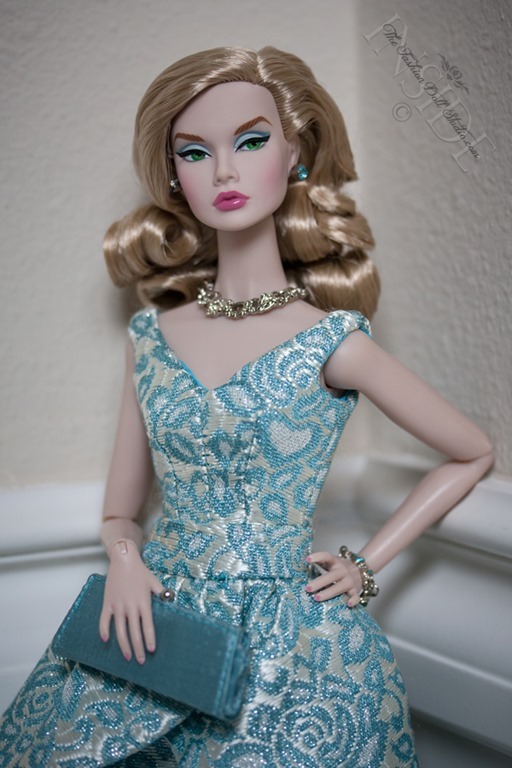 If David Buttry came up to me and said “Hey Rebecca…if I could design the perfect Poppy for you, what would she look like?”, my response would be this doll. 1) She is pink 2) She has pink jewelry 3) she has an updo 4) She has soft facial screening 4) She is wearing a high couture ball gown ( I feel Dior here) and 5) She comes with an adorable mini perfume bottle. I am just going to say it right now…if I don’t get the chance to purchase this one…there will be a sulk fest like no other before it then an immediate grouping of funds to purchase this baby on the secondary market. This one is a must have for me. It looks like this is another IT direct so not just WClub members going after this one. Good Luck to everyone and I may see you in the mud pit of secondary market purchasing after on this one. I need to go work out now. 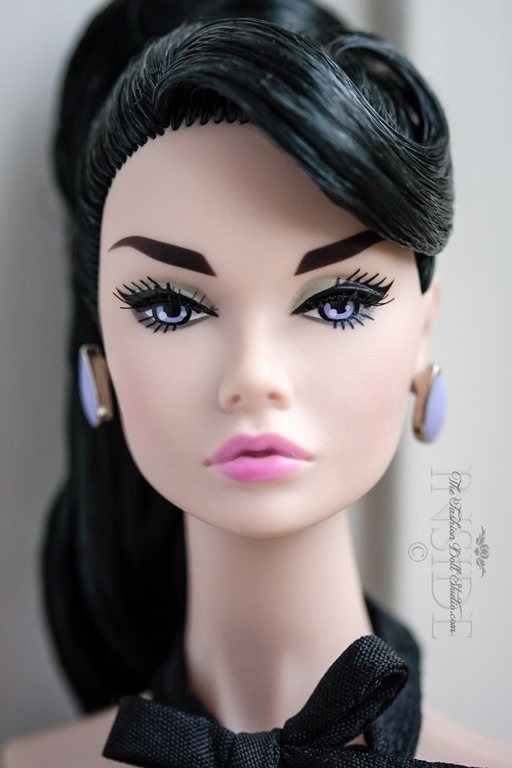 Next blog post up in 30 minutes talking about the debut doll from The Industry doll collection.